So now for the exciting bit, the chance to personalise your camper van. Firstly you will need some essentials for your first camping trip i.e. electric hook up cable, thermal window screens and also other camping accessories to suit your style of camping. A driveaway awning is for most people an essential piece of kit, giving extra space and some shelter from our English weather. 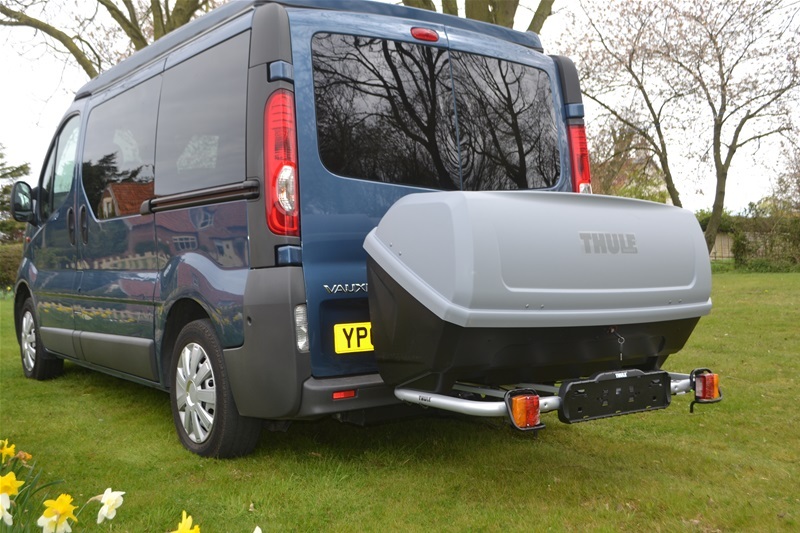 How about a Thule back box to carry some extra equipment or possibly a solar panel so that you can spend more time in remote parts of the country and then perhaps cruise control to make those long European motorway journeys less tedious. 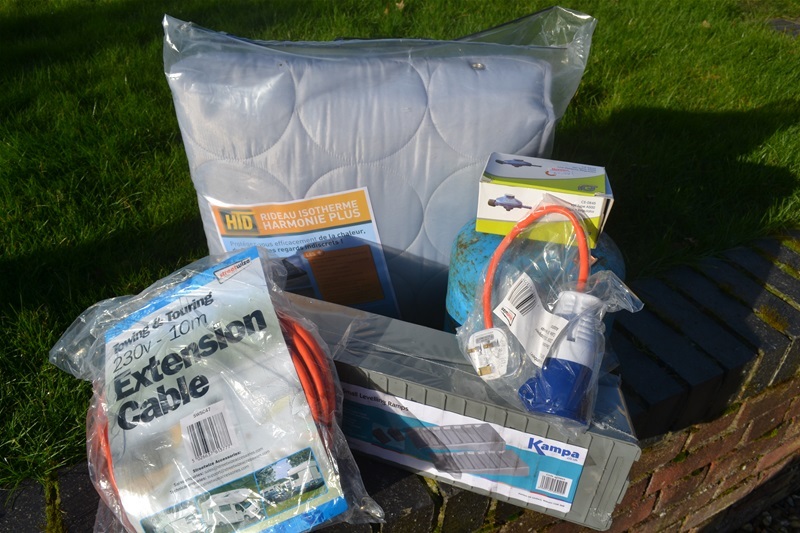 This starter kit contains all you need to get your camper van adventure started. 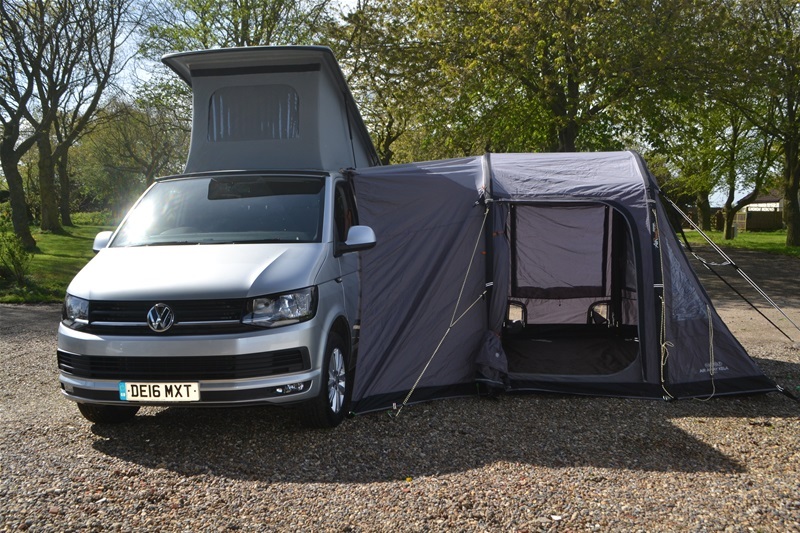 It consists of Campingaz 907 bottle, Campingaz regulator, thermal cab screens, 10m electric hook up cable, hook up cable adapter, camper levelling ramps. Now you're ready to go! 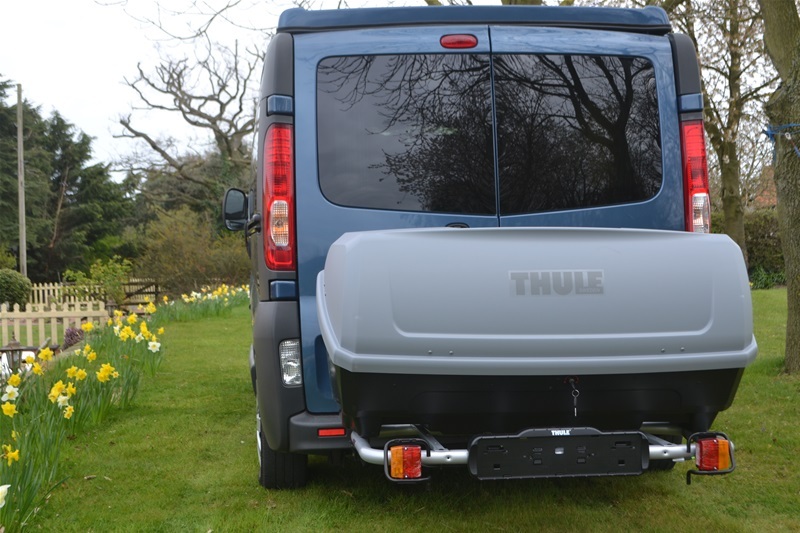 The Thule Backbox is a must for those who want to go on longer journeys or plan on taking the whole family. It fits on the towbar with just one bolt so fitting is literally a 2 minute job. 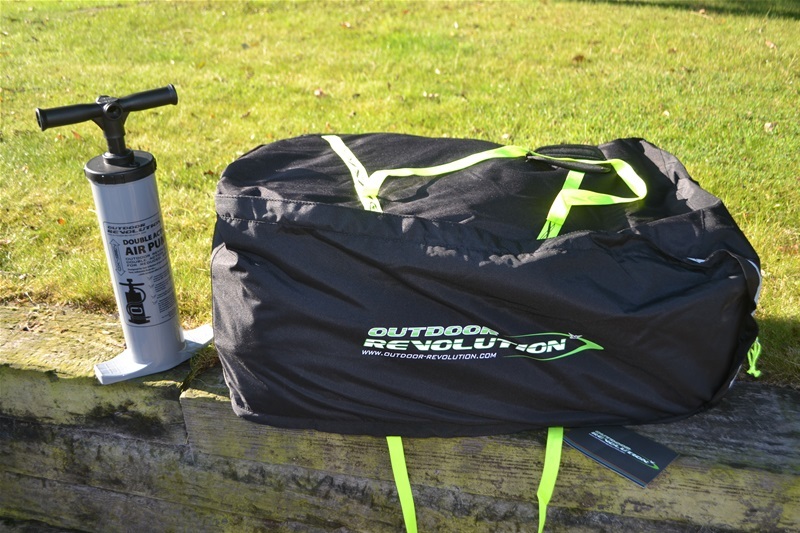 It can transform the amount of camping equipment you can take on your journey. 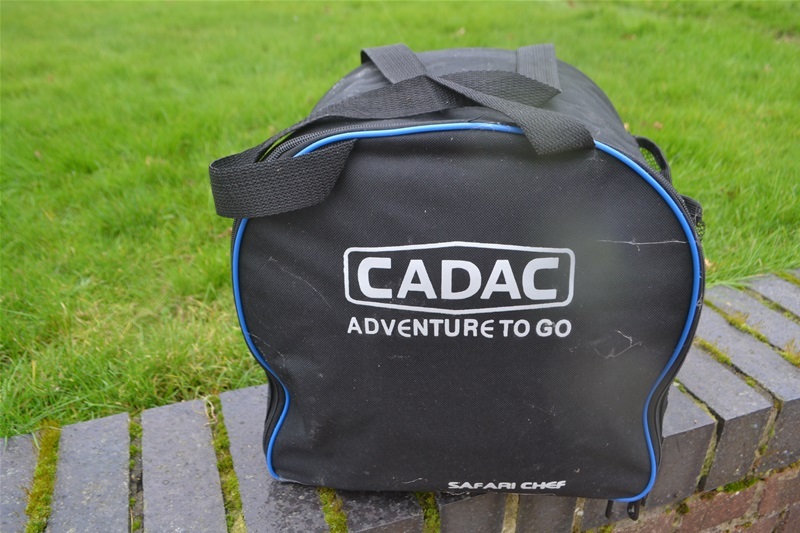 Ideal for storing BBQ's, awnings, sports equipment, walking boots etc. Indeed all the stuff you don't want cluttering up the inside of your campervan while you are travelling. The Thule system also has the advantage of being able to remove the box from its rack and then with extra rails makes into a bike rack. As much as anything else these are very stylish and look good on the back of your campervan. 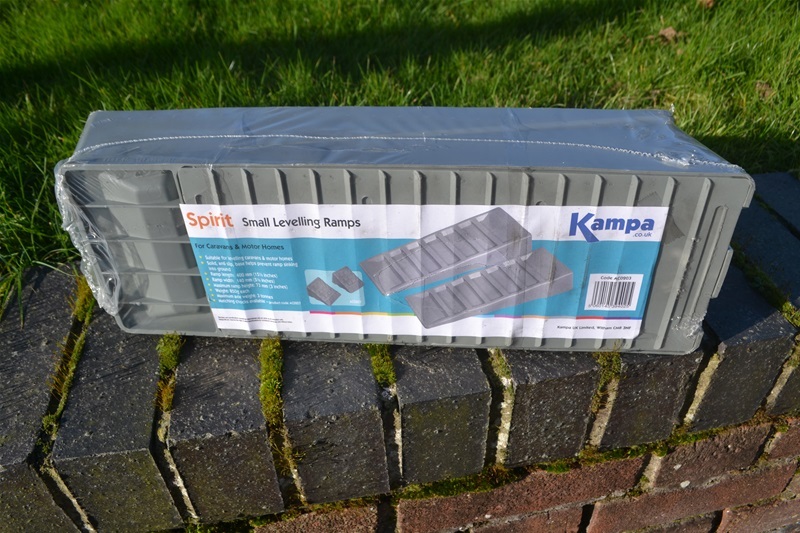 Hopefully you won't always be camping on a boring piece of flat concrete so these camper levelling ramps are very handy to keep your camper van level. Campingaz 907 bottle fits the cupboards on all our camper vans and most others. The advantages of Campingaz is that it is safe and can be bought in all European countries. The disadvantage, as with most gas bottles is that buying the first one is expensive. After that refills cost aproximately £30. For general cooking and average use this gas bottle would last most people a full season. 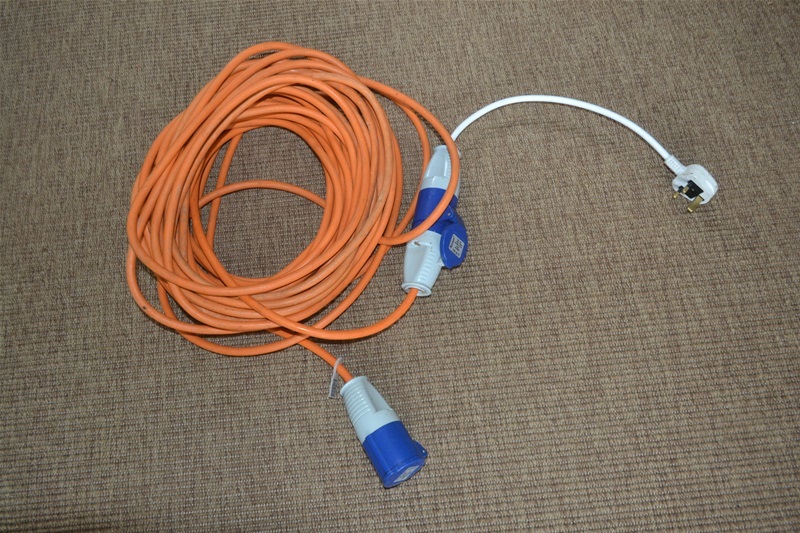 15 metre caravan, motorhome hi-visibility orange hook up cable/lead comes with 16 amp male/female IP44 blue plug and socket. Tested and ready to use. 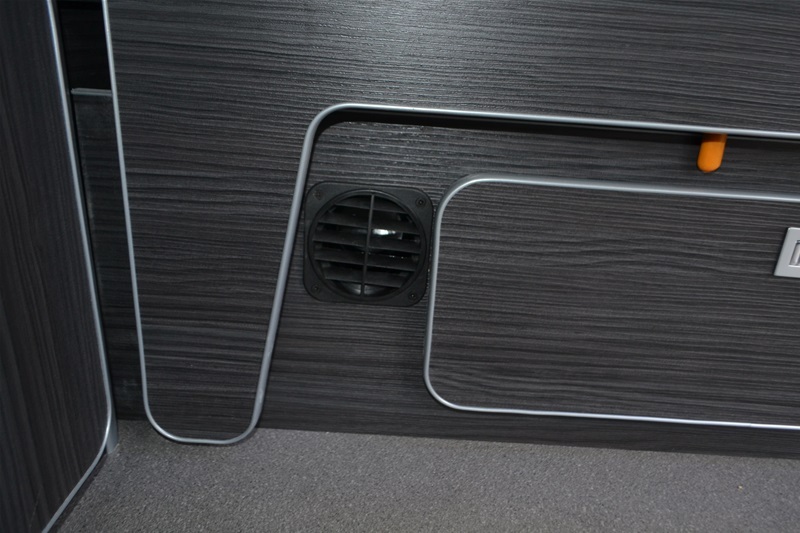 Personalize your campervan with a set of these VW sidebars. 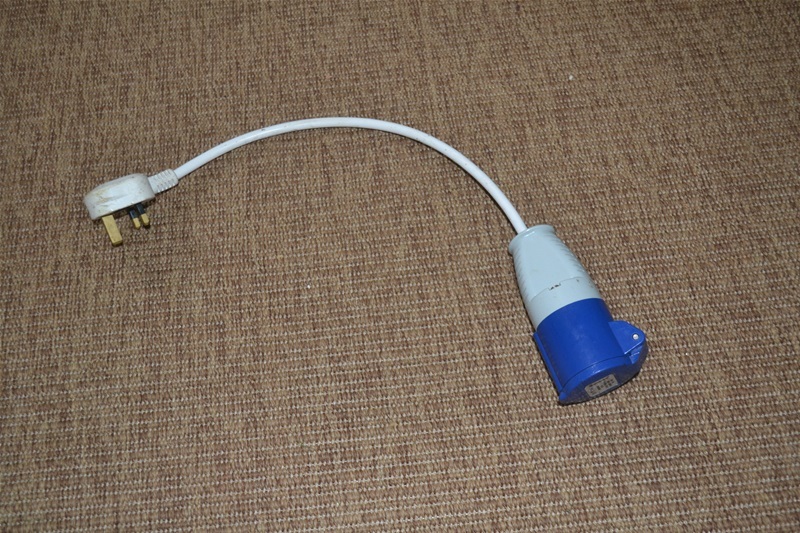 This UK 240 volt mains adapter is a handy item to have. 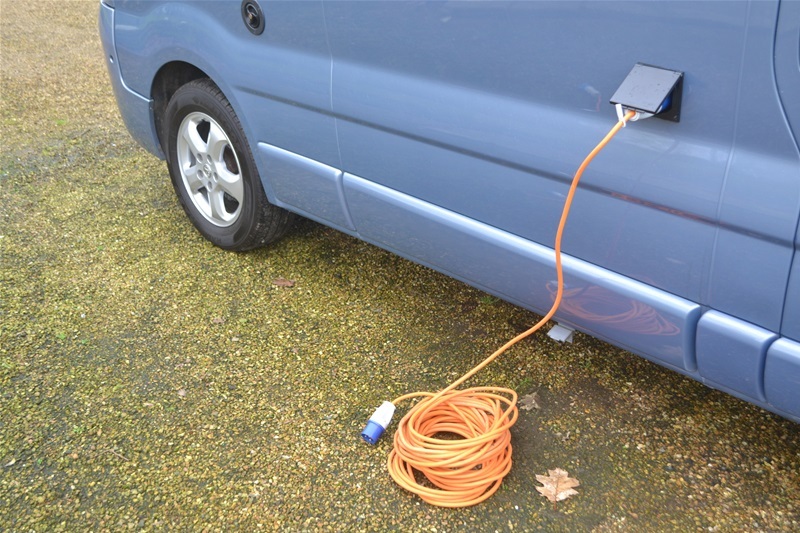 If your camper van is parked outside your home and you would like to have the mains electric working to pre cool the fridge or charge the leisure battery just simply plug this adapter into your household 13 amp socket and plug the other end into your mains hook up lead from your camper van. 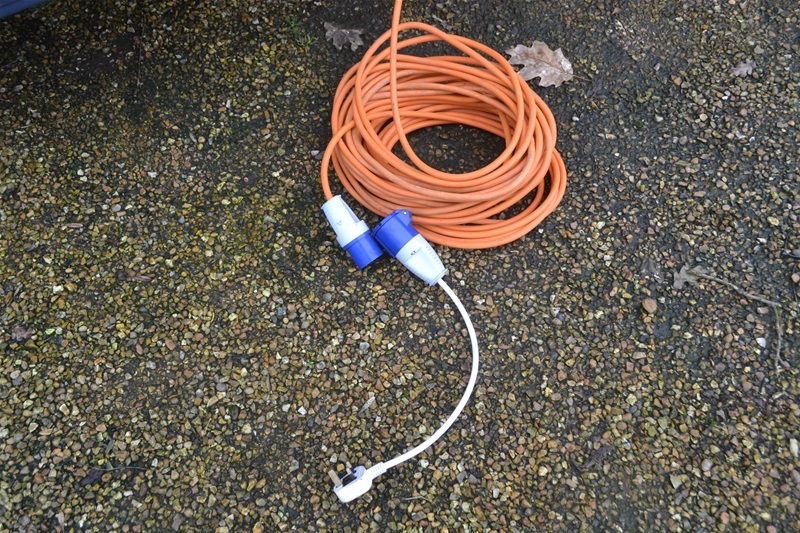 Also useful if visiting friends who don't normally have a full hook up facility in the garden! 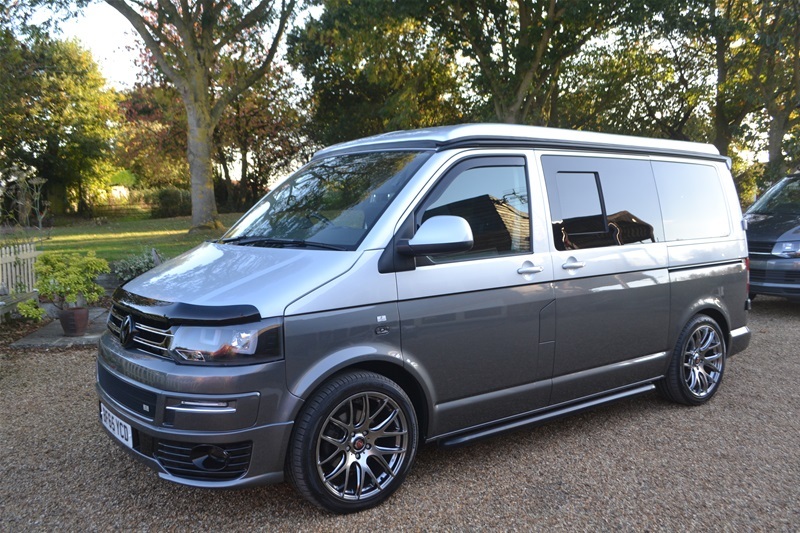 Add a colour coded rear spoler to personalize your campervan. 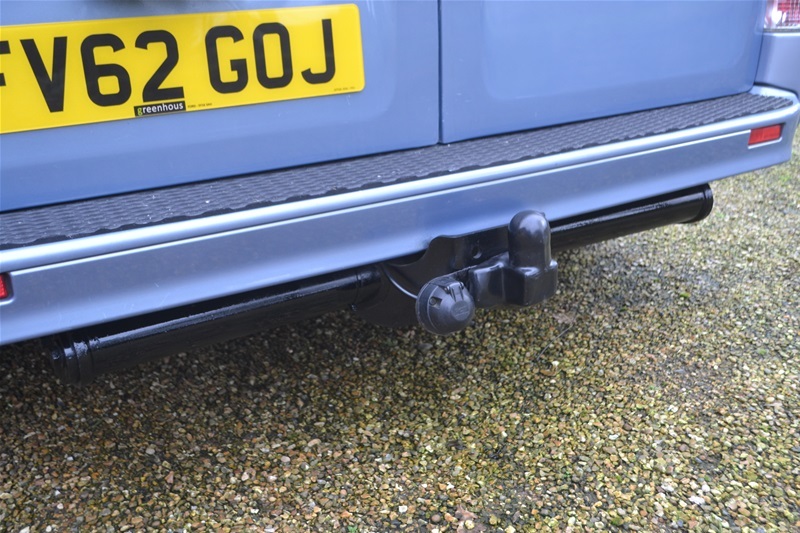 With this J Rail fitted to the side of your camper van any driveaway awning or sun canopy can be simply attached with out the need for guy ropes. 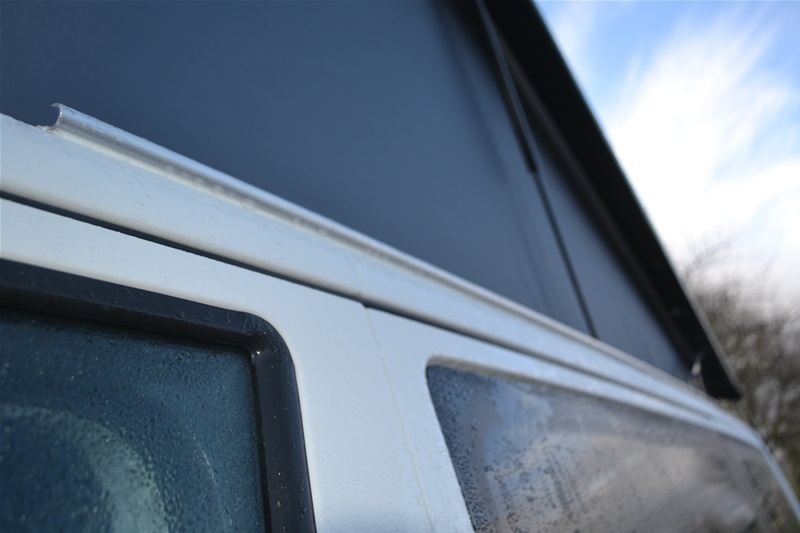 The advantage is that it is cheap and hardly noticeable on the side of your van and when your awning is attached it leaves a waterproof seal. This is the correct VW multitail. 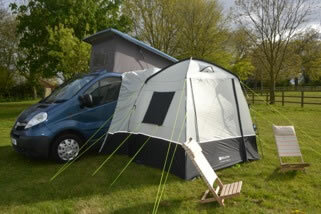 They are not cheap but look great on the side of the van and take more than one type and size of awning. They come in black or silver. A must have accessory. 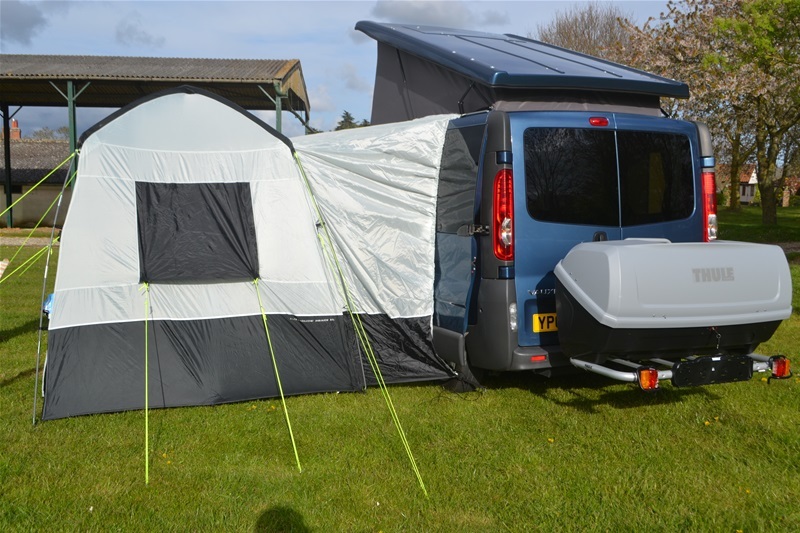 A driveaway awning is just about a must for camping in the UK. 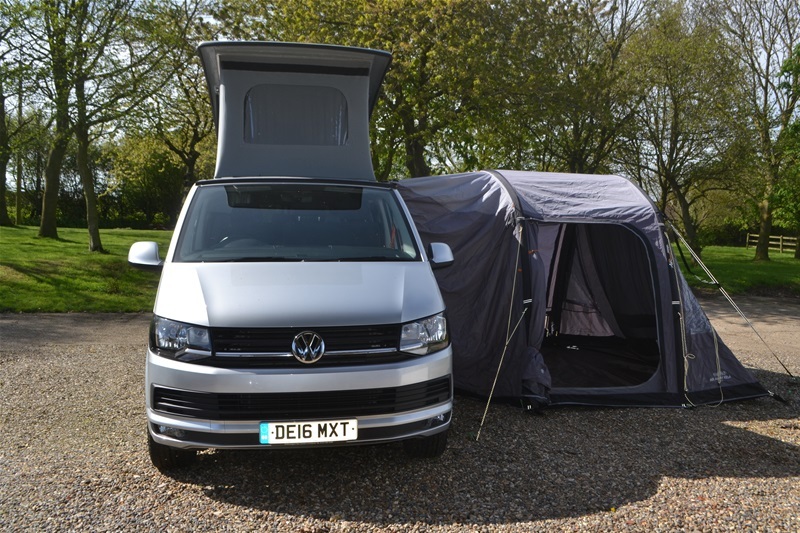 The idea is that it fits to the side of your campervan but you can unhook it, zip up the awning and drive off leaving your camping spot secured and some of your bulky items behind. It also gives extra space and somewhere to shelter from the sun or rain. Our advice is - not too big. The Easy Camp Shamrock fits nicely. 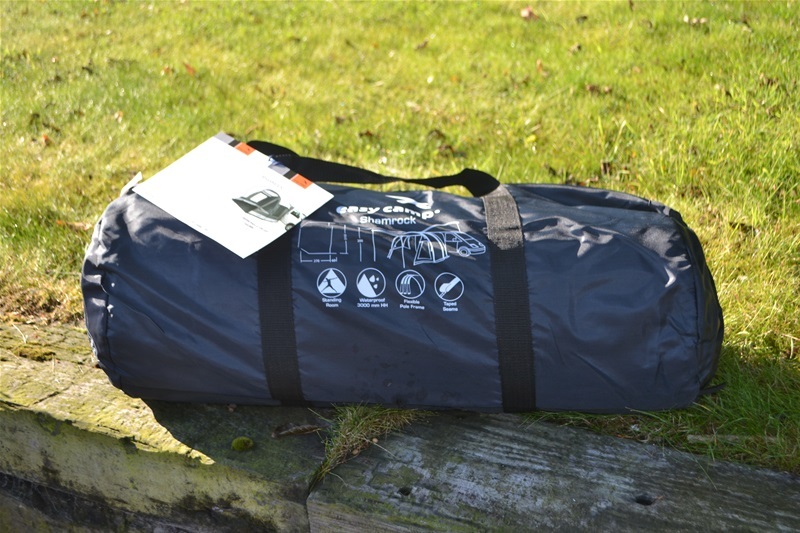 It is quick and easy to erect (you don't want to go back to camping) and fits into a small storage bag. Side panels are half windows and half mesh, ventilated zipped rear access panel, fibre glass frame, heavy duty zips, heat sealed seams. The Sunncamp Air 350 Grande is one of the latest in a line of inflateable awnings. 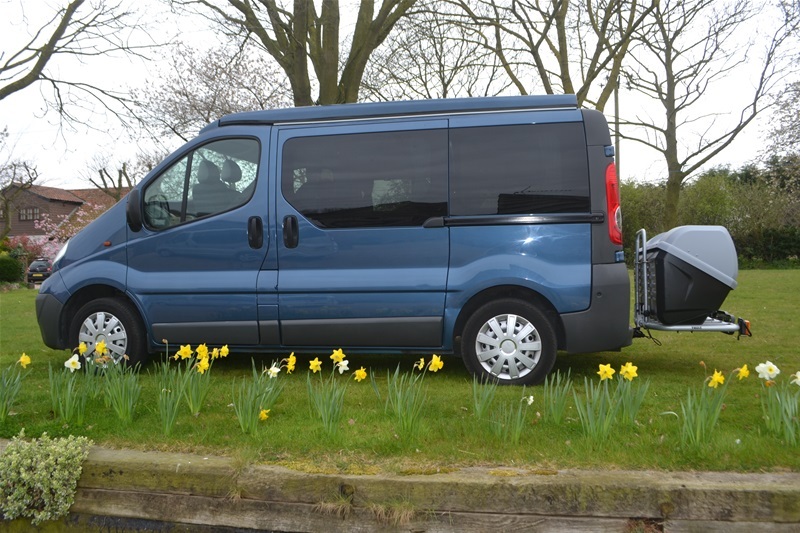 The advantages are that they are so easy to put up and attach to the side of your camper van. 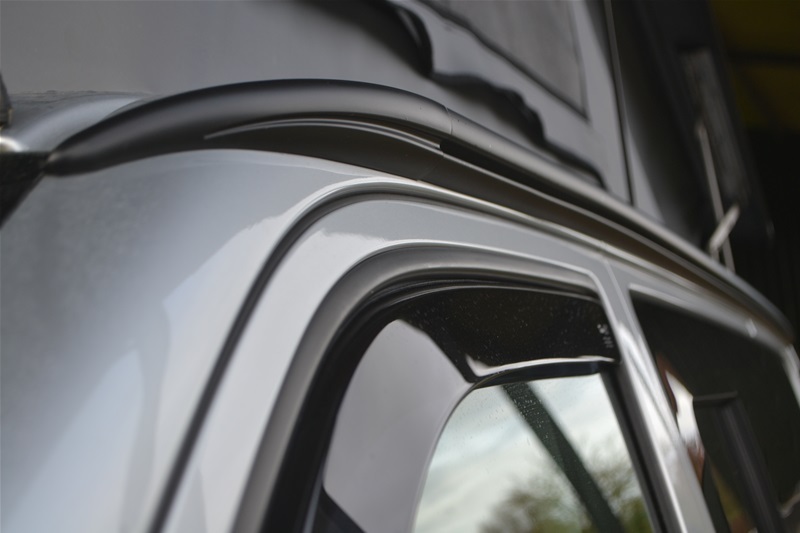 The disadvantages are that they come in a bigger bag than our standard awnings so therefore take up more space in your van. They are also, of course, more expensive. 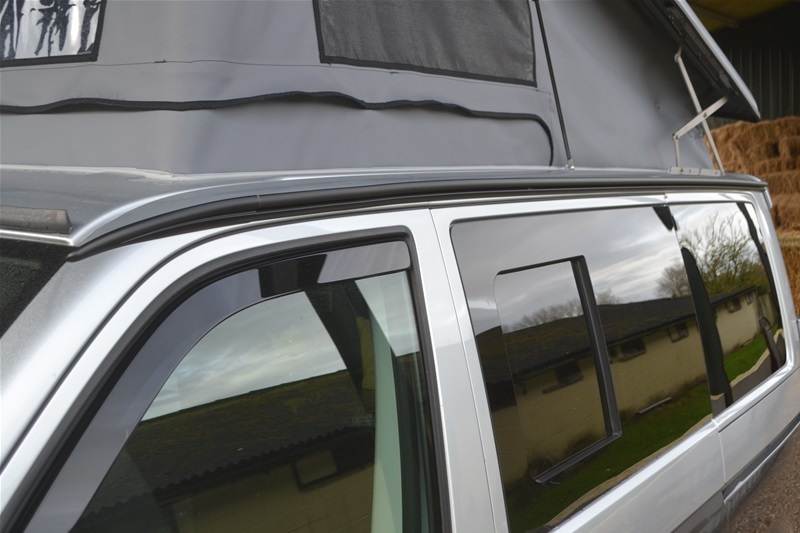 These awnings come with a lifetime guarantee and do make a great addition to your campervan. The Thetford 335 Qube Toilet is the most compact that Thetford produce and one of the cupboards in our camper vans has been designed to fit it. It is built from high quality durable plastic. The many innovative features are made to make life easier. 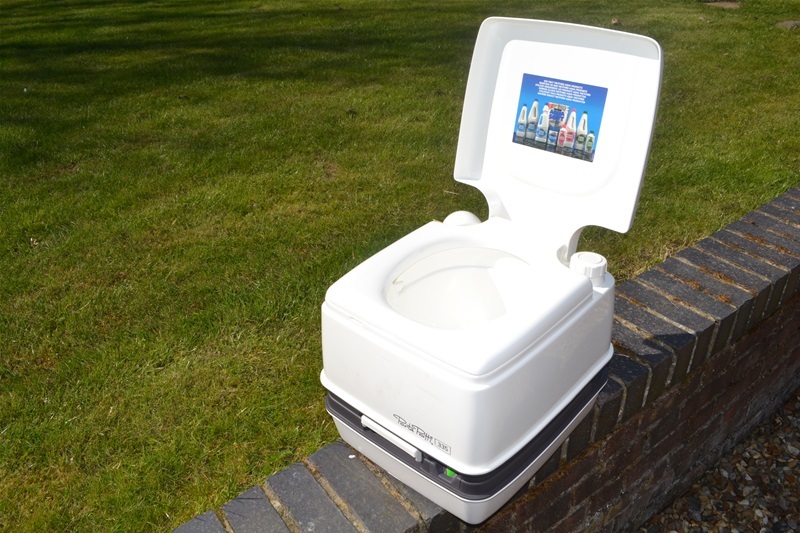 The Porta Potti consists of two halves that can easily be taken apart and put together again. The bottom half is the waste tank and the top half is a combined fresh water flush tank and seating bowl. The dimensions are H 315mm x W 342mm x D 382mm. 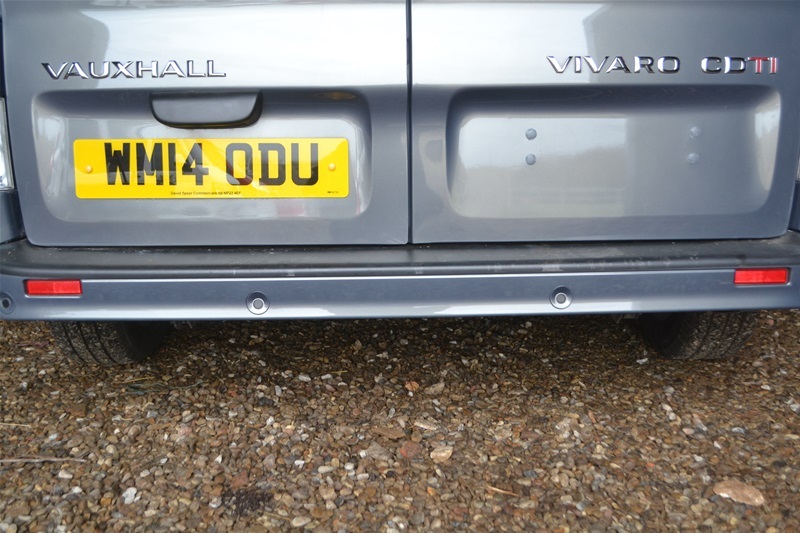 Most new vehicles have reversing sensors fitted and so we get used to parking with their help. 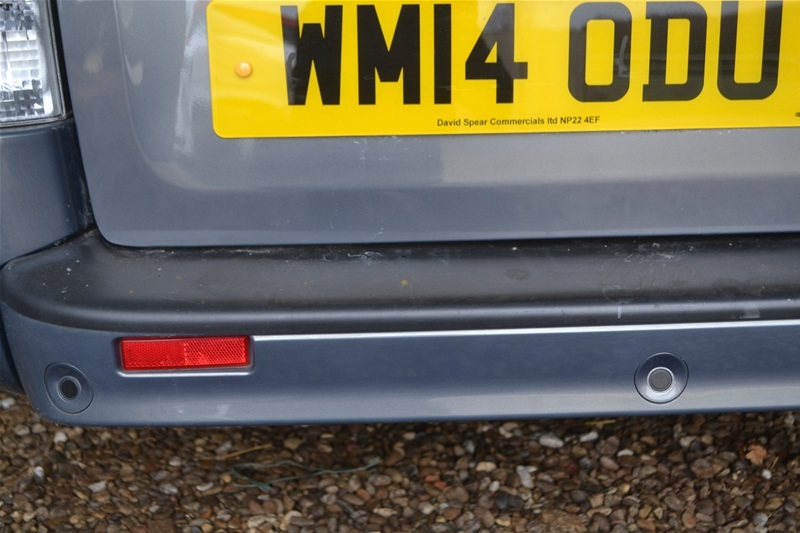 Many camper vans don't have parking sensors fitted but it is quite easy to have them retro fitted. We also have them colour coded to match your vehicle. 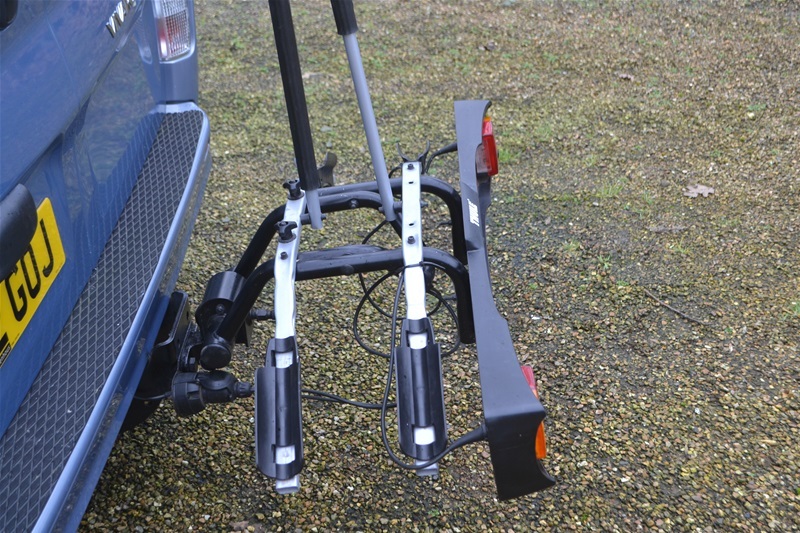 This Fiamma 2 bike rack is designed to fit on the left hand door of the barn door of a T5/6 campervan. The advantage is that the doors can be opened with the bikes in situ. They are both stylish and lightweight and make a great addition to your campervan. There are many ways to carry bikes on the back of your camper van. 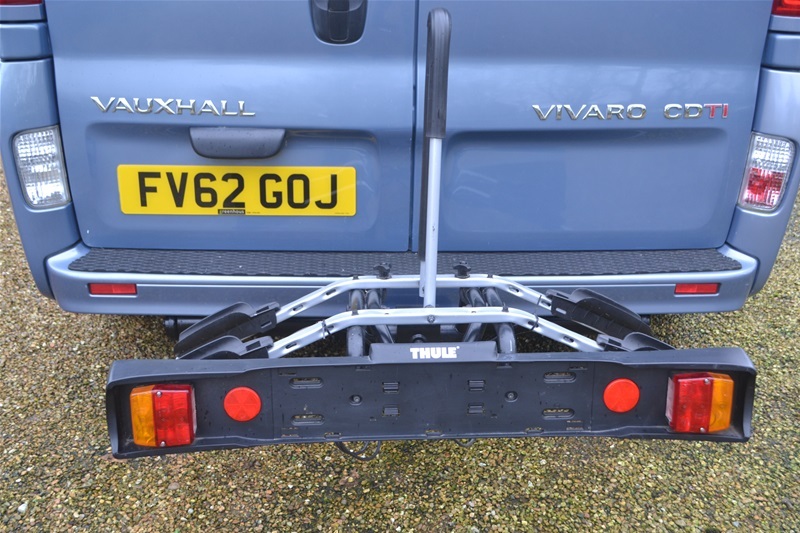 If you have a tow bar fitted then the Thule ride on tow bar mounted bike rack is the way to go. Just tighten one nut to secure it to the tow bar. 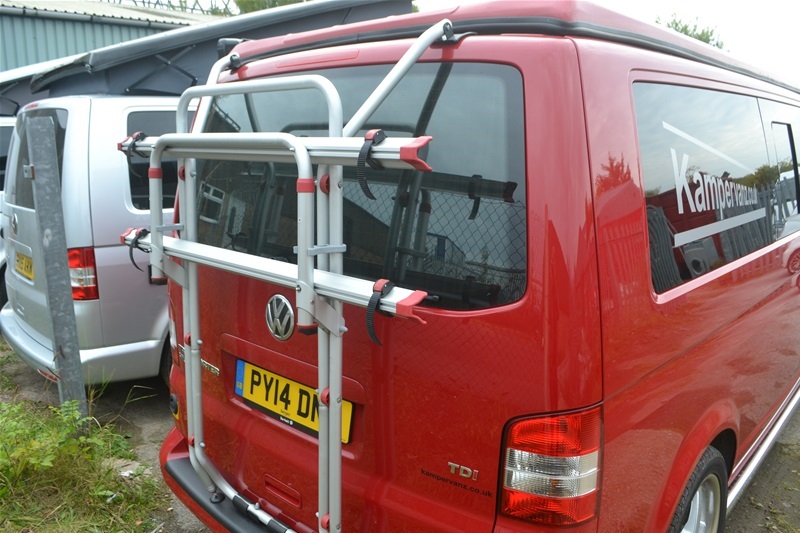 The advantage is that you can take it off your camper van easily when not carrying bikes. 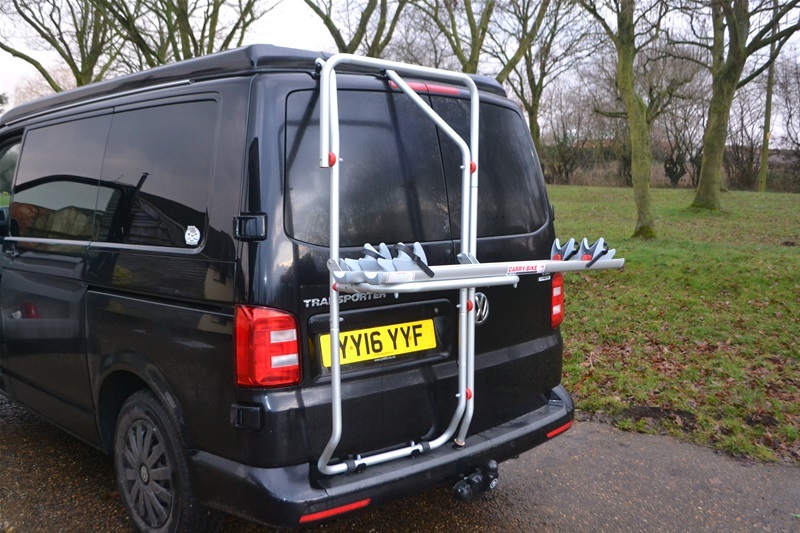 The Fiamma Carry/Bike Rack J15687 fits on to the rear door of a T5 and will carry a maximum of 2 bikes. Model No. 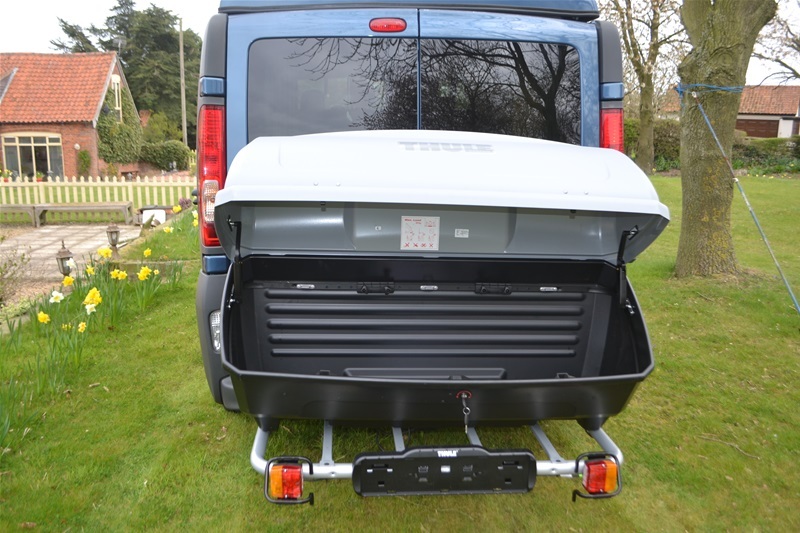 J15754 fits on to a tailgate model of the T5 and can carry a maximum of 4 bikes. Both racks are the same price. They are both stylish and lightweight and make a great addition to your camper van. 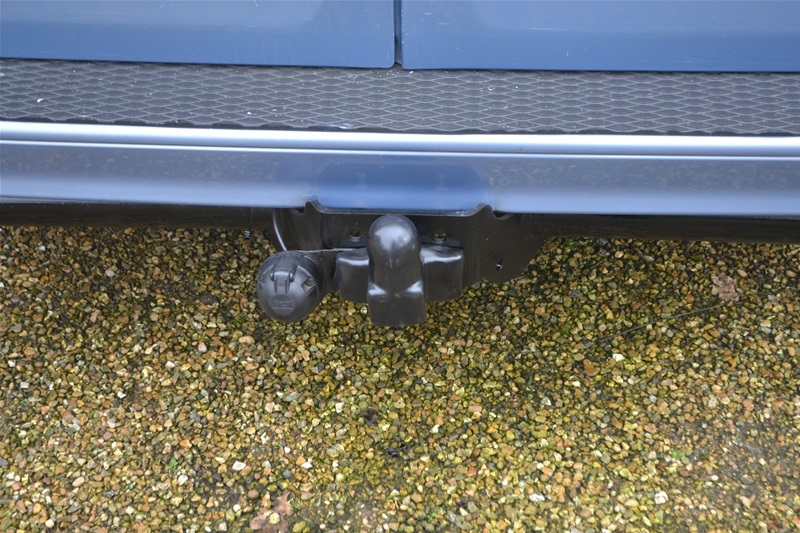 For us these discreetly fitted tow bars with single electrics are an essential piece of kit. 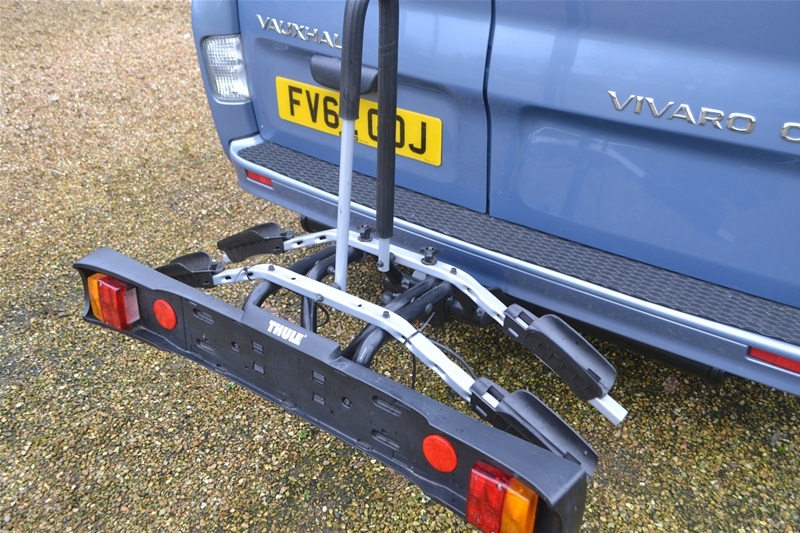 Obviously you can tow things if the need arises but it also allows for the fitting of many pieces of camping equipment that are tow bar mounted - back boxes and bike racks being very popular. 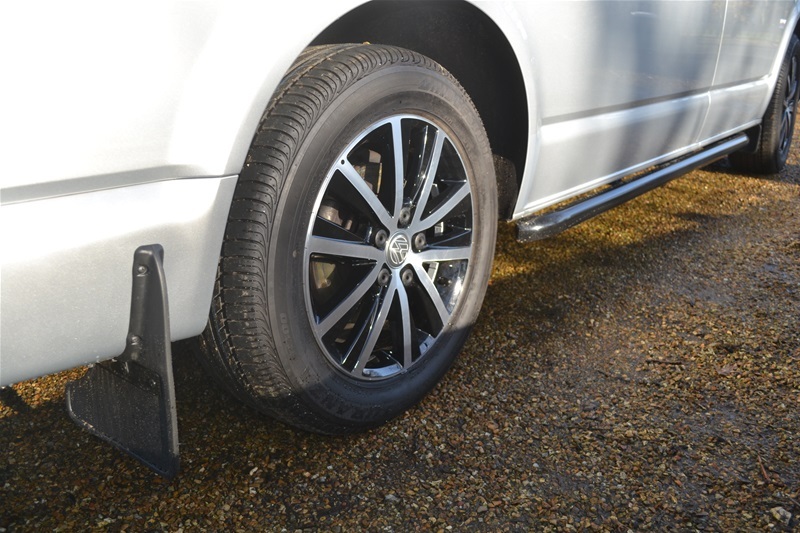 These detachable tow bars, although more expensive, really are the way to go. Obviously visually there is nothing to see and the tow bar just fits into place when needed. 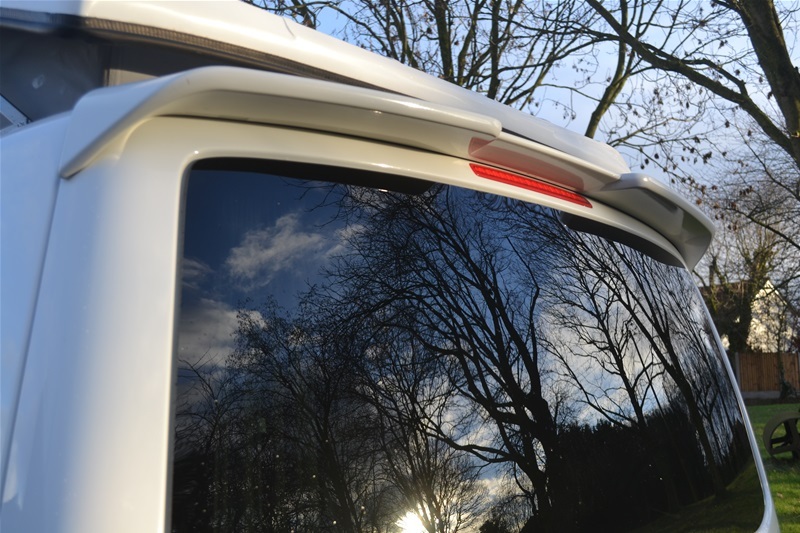 Thermal silver screens are designed to be fixed to the inside of your camper van cab windows to help retain heat in cold weather or reflect sunlight away from your camper in hot weather. They can be used in conjunction with curtains or on their own. The screens are held in place by plastic window suckers and can be put up and taken down in a few minutes. Silver screens provide almost total blackout for a good nights sleep and can be rolled or folded away for easy storage. We believe that using a camper van isn't a reason for living on burgers and fish and chips - nice as they are occassionally. 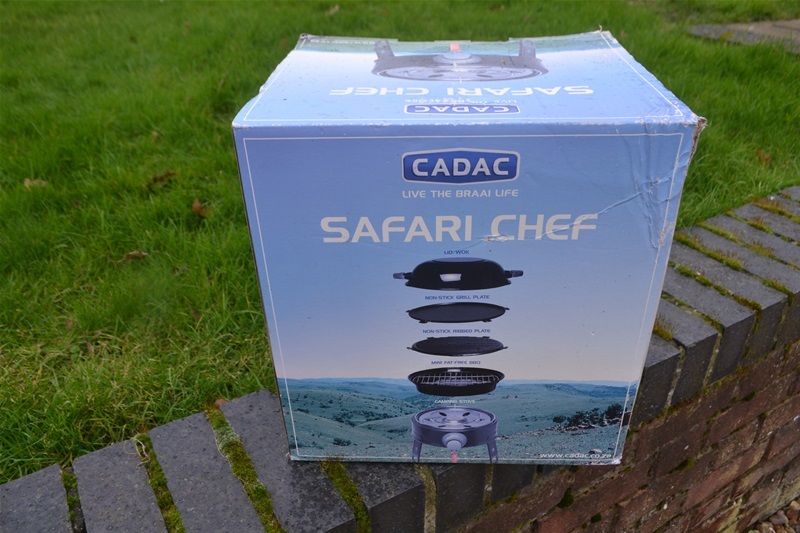 The Cadac Safari Chef can be hooked to a permanent fixing on the side of your camper van that runs safely back to your gas bottle. You can grill, fry, boil, bbq or stir fry on one of these. Just remember to take your cook book with you. It weighs just 4kgs and comes with its own small carry bag. Webasto is the market leader when it comes to diesel heating for all kinds of vehicles. 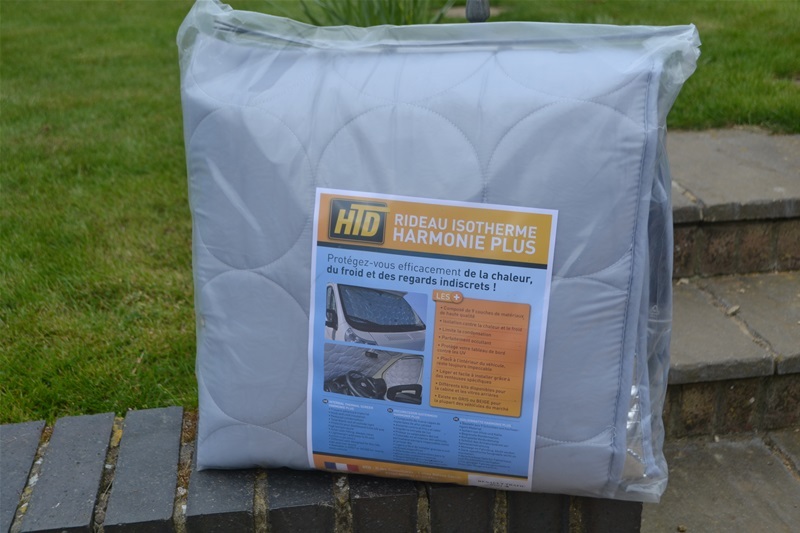 Rigorous testing has allowed them to develop heaters perfectly suited to your campervan. Just when the nights and days are getting cold Webasto heaters prove to be a rugged and reliable companion. Webasto comfort is something that you feel more than you see. 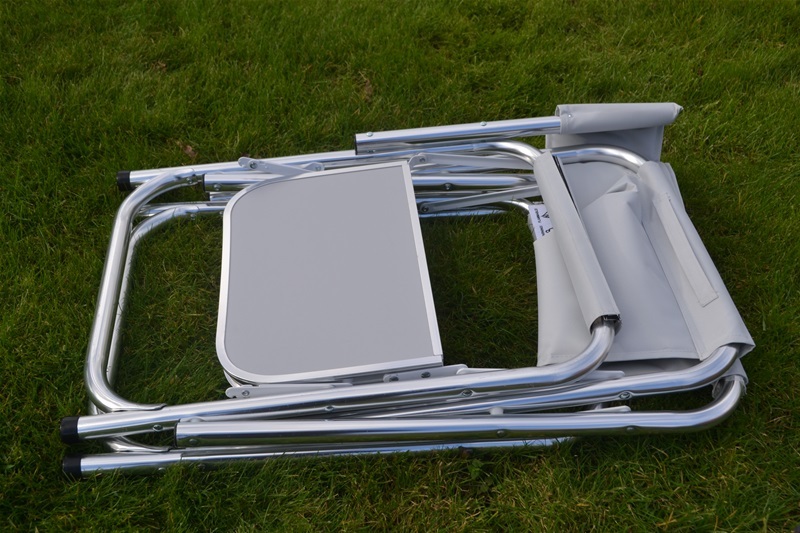 Finding a chair that is lightweight, comfortable and folds flat for campervan use is not easy. The chair that we personally recommend is the folding directors chair. They only weigh 2.8 kgs, fold down flat, are comfortable and have the addition of a small table on the side for your wine, beer or tea. Anyone who has been camping will know that you can spill more than you drink by leaving your glass or cup on the floor! 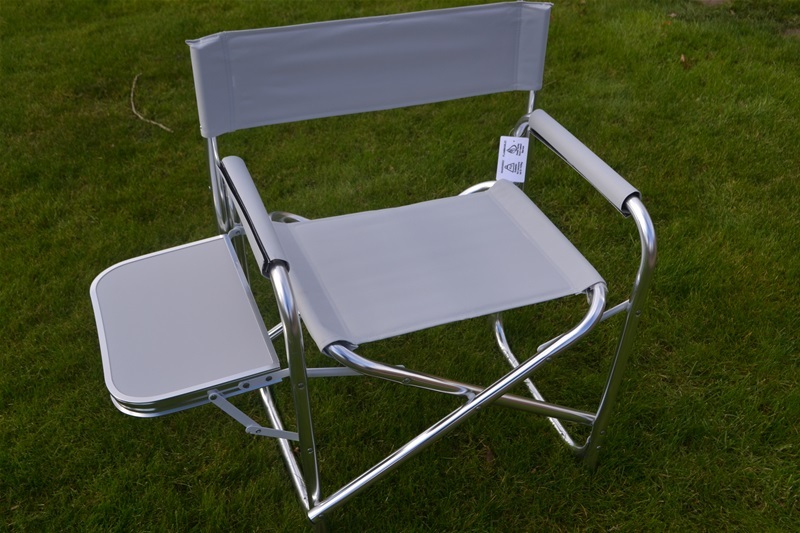 They come in standard light grey with aluminium tubing so look really stylish too. 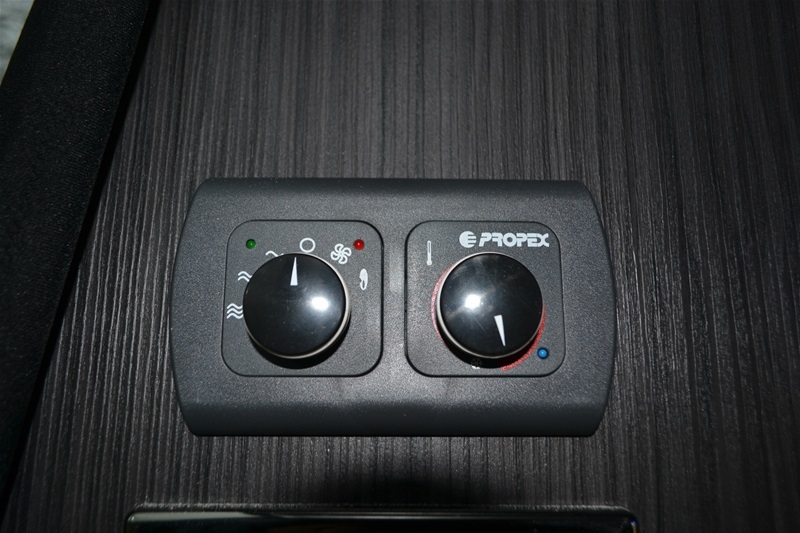 There are various heating systems that you can buy for your camper van, one of the most popular being the Eberspacher diesel heater. Personally we find that these have two disadvantages - they are quite noisy when running and they have a habit of flattening your leisure battery half way through the night. We recommend the Heatsource HS2000E gas/electric space heater. 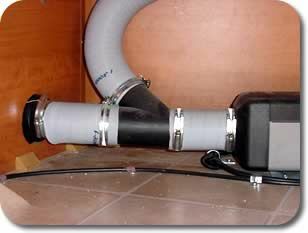 This heater can run off mains electricity with either 500, 1000 or 2000 watts or it can be switched to run off your propane gas bottle. It also has a thermostat to control the room temperature. The main advantage is that you will spend most of your time camping on campsites so you may as well use the electric that you are paying for and when you are free camping you can switch to propane. 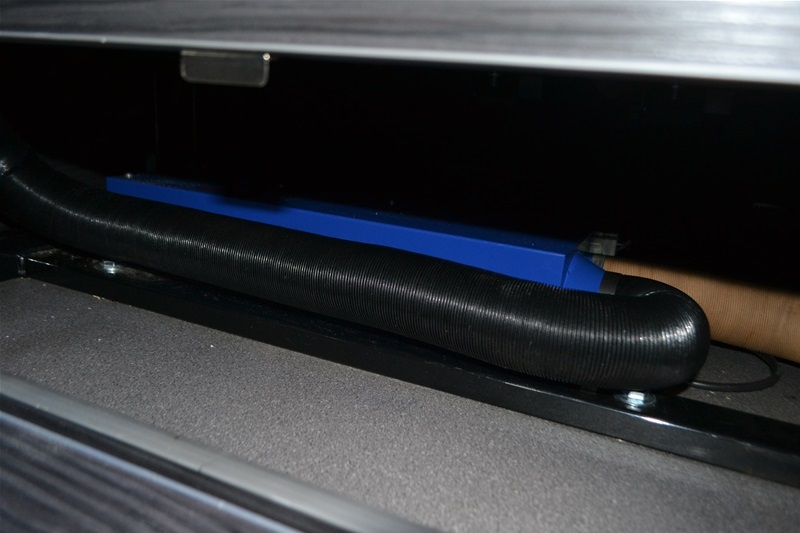 It is also quite a compact unit which fits under the bed but doesn't take up too much valuable space.